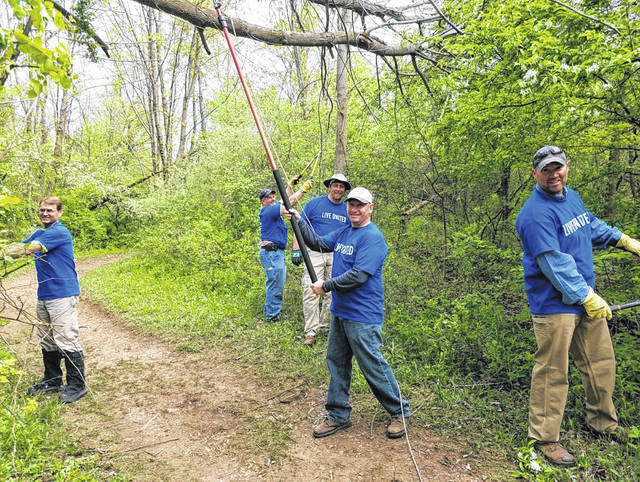 Volunteers from Vectren clear brush and debris from walking paths at Indian Lake State Park during Community Care Day, 2018. United Way’s signature volunteer event returns for a fourth year on Friday, May 10, and the organization is recruiting service projects from non-profits, parks and government agencies for completion by teams of corporate volunteers on that date. Volunteers from Citizens Federal Savings & Loan work on a landscaping project at the Hilliker YMCA during Community Care Day, 2018. Mandy Goble and Tom Denbow of Mary Rutan Hospital help prepare the Hoffman Pool for opening during Community Care Day, 2018. United Way is working to play the role of “matchmaker” with its upcoming Community Care Day, pairing volunteer teams from area workplaces with group service projects. Logan County’s signature corporate volunteer event returns for a fourth year on Friday, May 10. 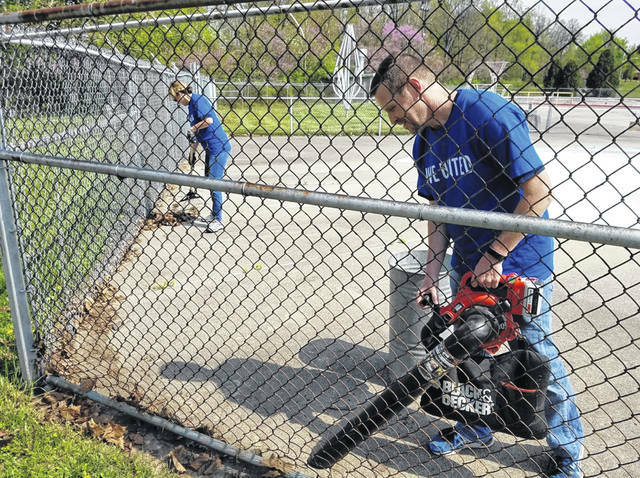 A total of 170 volunteers from area workplaces, churches and civic organizations are already registered with at least 100 more expected to turn out to work on pre-arranged group service projects that will make a difference in the community. United Way is encouraging all non-profit and government entities that serve Logan County to submit project requests for a volunteer group to complete on that day. Last year, more than 250 volunteers teamed up on 35 projects throughout Logan County. Agency leaders are encouraged to plan ahead and think big. An ideal project would take a group of five to 20 volunteers between four and six hours to complete. That’s a lot of free manpower and is an opportunity for an agency to be creative about a projects it hasn’t had time, manpower, or resources to complete on its own. Project Request Forms are available online at www.uwlogan.org or by calling (937) 592-2886. Agencies can submit more than one project. Requests should be submitted as soon as possible to ensure consideration, but no later than Monday April 15. After projects are submitted and approved, volunteer groups can register online at the same site and sign up to complete the posted projects. By May 1, registered volunteer groups will be paired with the available projects, with lead volunteers put in touch with agency contacts to finalize details so everyone knows where they are going and what they will be doing in advance of Community Care Day on Friday May 10. On the morning of May 10, volunteers will gather at the Bellefontaine Regional Airport for a complimentary breakfast, receive free t-shirts to wear that day, and head out to complete their projects. Presenting Sponsors for Community Care Day include Citizens Federal Savings & Loan and Liberty National Bank. T-Shirt Sponsors for Community Care Day include Belletech, Community Health & Wellness Partners, Logan County Electric Cooperative, St. Vincent de Paul Chapter at St. Patrick Church, Thompson Dunlap & Heydinger, and Vectren. For more information, please visit www.uwlogan.org or by call United Way at (937) 592-2886.